How do you deploy a highly available fileserver in Azure? Do you count on the SLA (99.9%) of Azure when using premium storage, so doing a single fileserver? 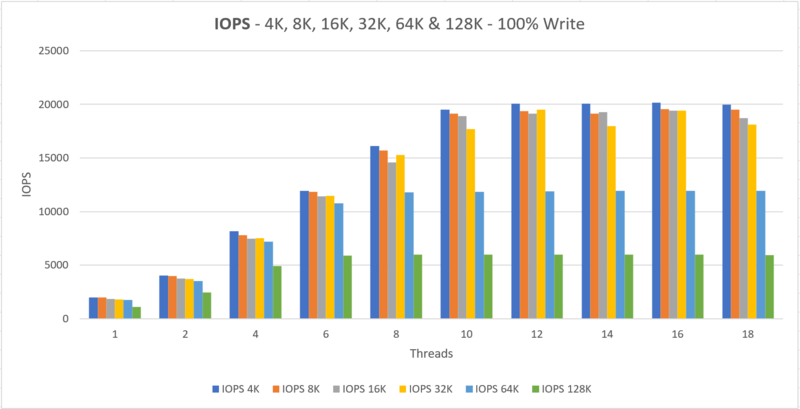 In this post I’m diving in on Storage Spaces Direct in Azure, giving a few guidelines but also some real-world performance results. Got quite a few charts and tables in there, get an extra coffee. Hang on tight, here we go! Not only the types of disks you choose for the solution is important, the VM size is key in this. Each Premium Storage-supported VM size has scale limits and performance specifications for IOPS, bandwidth, and the number of disks that can be attached per VM. When you use premium storage disks with VMs, make sure that there is sufficient IOPS and bandwidth on your VM to drive disk traffic. So even if you combine 10 premium storage disks, it does not mean your VM will actually handle the IO because of VM limitations. And to be frank, many times you end up with a VM size that is way oversized on the CPU and Memory side if you only use it as fileserver, which means $$$. Running tests with threads from 1 to 18. Results have shown that we are hitting limits using between 8-12 threads. Charts and tables are shown for 100% read and 100% write tests. As Storage Spaces Direct is depended on Ethernet for storage replication I thought it would be fair so see what a single server with locally coupled disks could do. After this we compare it with a S2D cluster. The server has 4x a P30 disk attached (5000 IOPS – 200 MB/s) which totals up to a 20,000 IOPS and/or 800 MB/s limit. The VM size “Standard L16s” is capable of doing 20.000 IOPS which we are able to reach with 4x P30, which also sums up to a 20.000 IOPS limit on the storage side. The focused reader should have noticed that we had the same things to notice with a single server and a Storage Spaces Direct cluster. I did the below comparison on the ’12 threads test’ as this is the test that gets the most out of the storage. Doing smaller IO, the results are not that far apart. 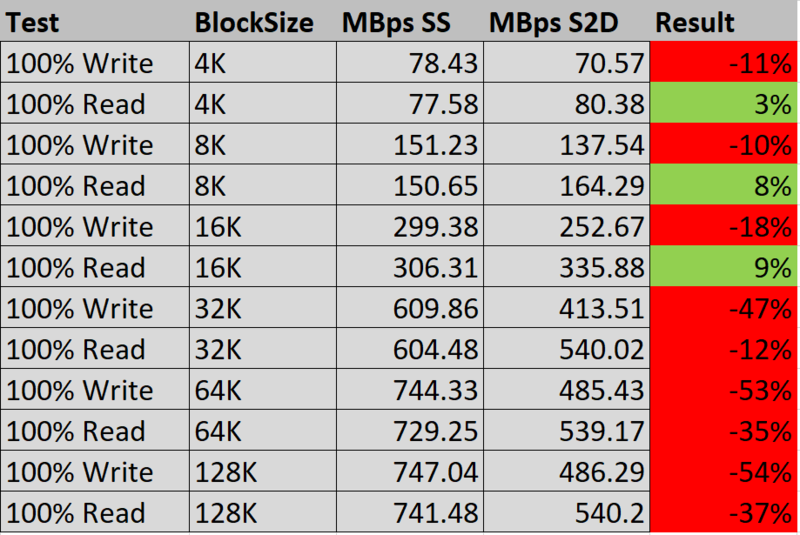 Same goes for the MBps. 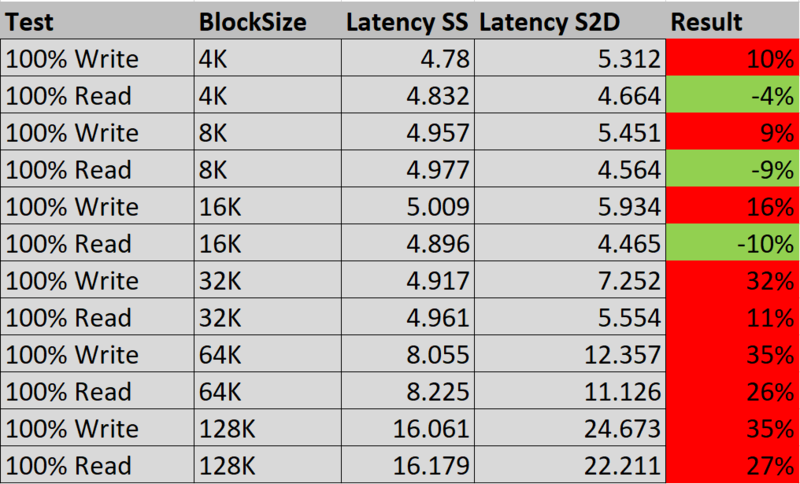 The latency table contains the most valuable information we’re looking for, it shows the latency in milliseconds is not far apart. Even though reads and writes have to come from another (remote) node, the latency difference is very small. AND I have not enabled Network Acceleration. This shows that the latency we see in the tests are coming from the storage and not the network side. If you paid close attention on the comparison tables you’d see that the same tests are either red or green, it all correlates. For example, the Premium Disk P30 disk limit is 5000 IOPS and 200MB/s. This is the upper limit you can get for async IOs if you push enough IOs. For single thread sync IO, you will never get to this limit unless the sync IO uses multiple processes/threads that keep the outstanding IO or disk queue high. 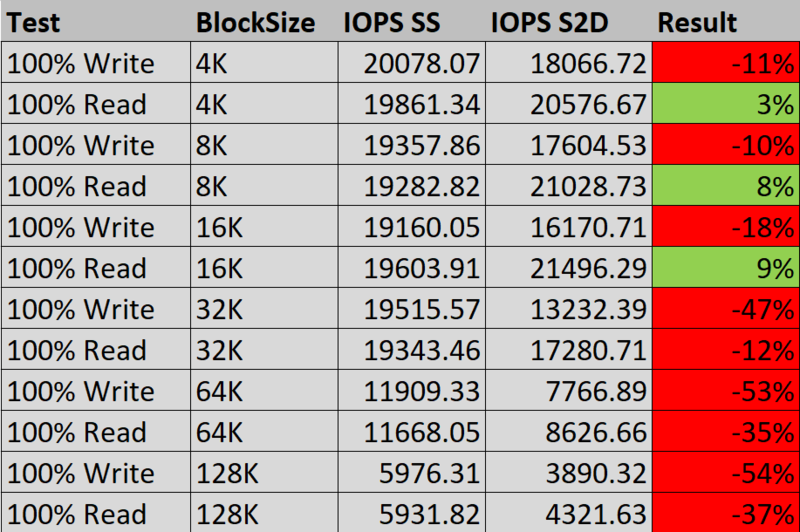 Most of the existing docs simply suggest adding more disks to improve the performance and we frequently see customers adding more disks; however, in this kind of sync IO situation, additional disks will not help. The truth is, for single thread sync IO, the max IO you can get is only related to the disk latency. To further demonstrate this, think about a situation where you have a team to help you send packages to your remote office. Each time you ask a team member to take a package from the main office, drive to the remote office, return to the main office, and then ask the second team member to do the same. If the round trip time is 10 minutes, then no matter how many employees you have, you can only send six packages per hour. This is how sync IO works. Therefore, to calculate the IOPs for Premium disk, we will simply need the disk latency. For Azure Premium disk the latency is around 2ms. In 1 second (1000 ms), you can get 1000ms/(2ms/IO) = 500 IOs. Since the limitation is on disk latency, you cannot improve this even if you add additional P30s. We see customers wasting money on the additional storage in hopes that there will be better performance on sync IO, but unfortunately it will not. 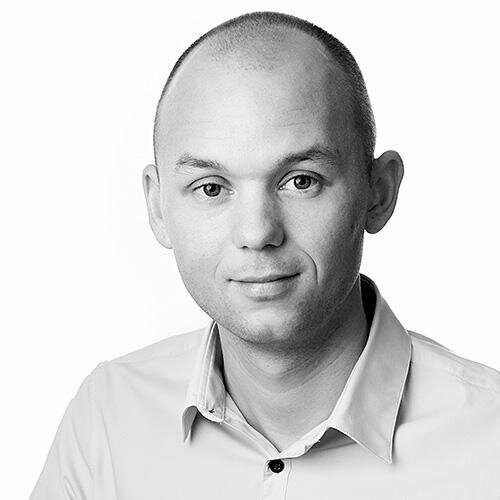 Are we using Sync IO with Storage Spaces Direct? Definitely! We need to know if the write IO is actually written so we are waiting for that acknowledgement. 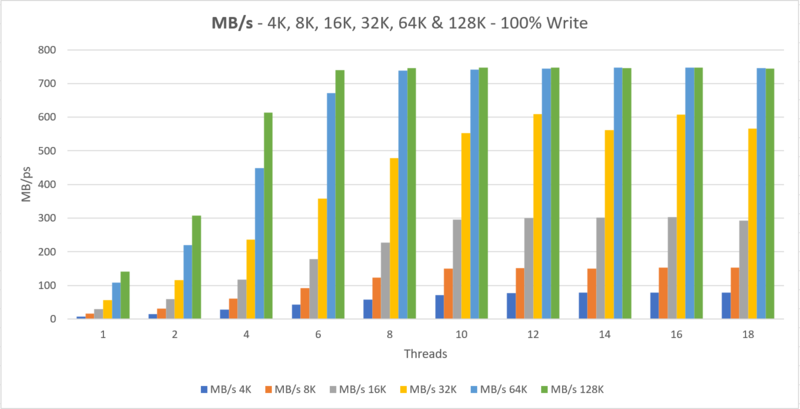 No matter how many disks you add to your server or cluster, the only way to scale performance from our side is more threads. With more threads we can get the maximum performance out of the disks. With more disks, more threads are needed. Microsoft is hopefully working on things on their side to reduce latency which will benefit us. Yes, Azure is still cool and rocking but if you want real storage performance with low latency than Azure could not be for you. Unusable? No. I have heard customers who are running File Servers and User Profile Disks on a S2D cluster in Azure without notable issues. Curious about your experiences! Leave a comment! Note that while the L-series is described as “Storage optimized” this is specifically with respect to the use of the large temporary disk rather than durable data disks hosted in Azure Storage. 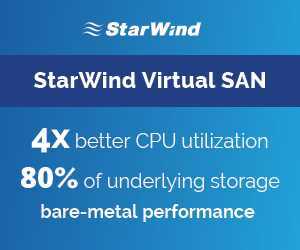 Unlike other Premium-Storage capable VMs the L-series does not provide a local cache, which limits the upper IOPS limit for durable data disks. The L-series is intended for NoSQL stores, such as Apache Cassandra and MongoDB in which data can be stored on the temporary disk but made durable through the creation of multiple replicas stored on other VMs in the NoSQL cluster. Thanks for this info Neil!